ChlorKing® Expands Equipment Supply & Maintenance Program to 60 Months Enables Pool Owners and Operators to Trade Large Capital Outlay for Fixed Monthly Payment - ChlorKing, Inc.
Norcross, GA June 29, 2016 – ChlorKing® has expanded its Equipment Supply & Maintenance Program for all of its water sanitization systems to 60 months, giving pool owners and operators the option to choose a 36-month program or the new longer agreement. The program covers the cost of the equipment and repair parts and labor for the life of the contract. Customers only need to provide the salt for their equipment. The cost of the program depends on the number of units ordered, their sizes and the length of the agreement. At the end of the agreement, pool owners and operators have the option to buy the equipment outright for $1 or have new ChlorKing equipment installed for a new 36- or 60-month period. Pearce added that in addition to enabling pool owners and operators to create a monthly budget for reliable equipment, they can also lower their costs by switching from chlorine to salt-based sanitization systems. 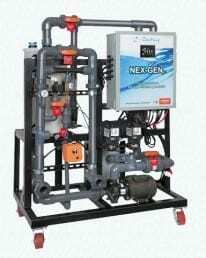 ChlorKing’s NEX- GENpH series of onsite batch chlorine generators can produce a gallon of bleach for 43 cents, which is about one-third the cost of chlorine. ChlorKing systems’ safety also helps reduce costs. Founded in South Africa in the 1970’s, ChlorKing moved its manufacturing and distribution operations to Atlanta, Georgia in 1999. With more than 8,000 commercial swimming pool and water park installations worldwide, ChlorKing is the world’s leading designer and manufacturer of on-site chlorine generation and salt chlorination systems. The company’s patented technology produces large amounts of chlorine in a single cell, eliminating the need for banking multiple small cells. ChlorKing Inc., 6767 Peachtree Industrial Blvd., Norcross, GA 30092-3665. Tel: 770-452-0952 sales@chlorking.com.